5,000 babies are murdered every year in “Pro-Life” Oklahoma. 225,500 Oklahoma babies have been murdered by abortion since the Roe v. Wade ruling in 1973. 15-20 babies are taken away to death every business day inside one Oklahoma’s 5 Free-Standing Abortion “Clinics” (child-sacrifice centers). Contrary to popular belief, the Oklahoma legislature has the ability to enact measures that would protect every pre-born human being from being murdered by abortion. 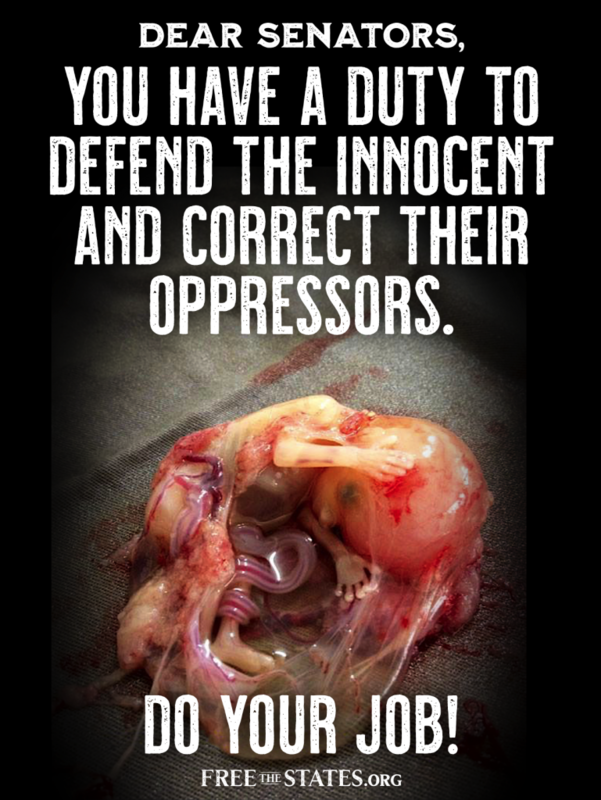 Our legislature is more than capable of establishing justice for the pre-born. All they have to do is write and approve a bill that defines abortion as murder and removes the exemption for abortion from our current homicide laws. This would establish justice and equality for all human beings living within our state. Prior to Joseph Silk’s Bills calling for Total and Immediate Abolition, no such bill had been forthcoming from the legislature of the State of Oklahoma. Our legislature can Abolish Abortion, they just choose not to. They choose instead to regulate abortion in the place of criminalizing it. But legislators should not be in the business of regulating Murder. It is their duty to pass laws to protect the innocent and punish the evil doer. And that is exactly what SB13 does! Oklahoma Legislators have passed many laws regulating who can perform abortions, what must be done before a baby is murdered by abortion, where babies can be terminated, by what age they must be killed, how an abortion may and may not be performed and why, but they have never sought to abolish abortion itself. Think of it like this: Imagine abortion as a tree where all of the branches represent the various ways a baby may be aborted. Pro-life politicians have attempted to prune the branches but have never once attempted to chop the tree down. A good example of this is the much celebrated pro-life victory of banning “dismemberment abortions” back in 2015. That bill stated that a baby could not be dismembered with forceps but could be dismembered with sharp surgical tools and suction devices. Many bills like this have been passed and celebrated as evidence that Oklahoma is a pro-life state. But they have done nothing to prohibit the murder of children. This explain how it is that our pro-life politicians can celebrate how pro-life we are as a state while the murder of preborn children goes on unabated. But it doesn’t have to be this way. Most of the time, pro-life politicians aren’t even pruning the branches but actually passing pro-choice laws like the recent 72 hour waiting period law which said that a mother may choose to abort her child so long as she premeditates the murder for at least 3 days. 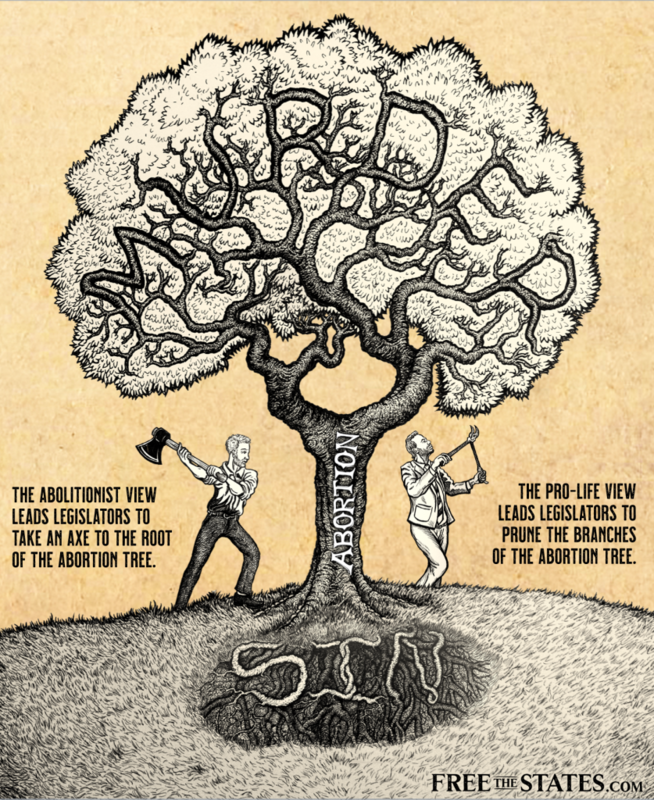 Examples of this sort of bill abound and this year as Senator Silk has put forward a bill taking an axe to the root of this wicked tree, pro-life politicians are once again putting forward bills to regulate (prune) abortion instead of unifying together to accomplish the abolition of abortion in Oklahoma. But they still have time. They have the votes to pass SB 13 and the leadership of the Senate and the House all claim to be against abortion and our new Governor has repeatedly promised to sign any and every anti-abortion bill that comes across his desk. All our legislature has to do is pass SB13 on to Stitt who can then sign and enforce it. For those thinking that a state has no right to uphold the principles of the Declaration of Independence and that the supreme Court must first repeal Roe, consider this: The Supreme Court is never going to reassess their ruling in Roe unless some state actually challenges it. Passing SB13 is necessary even on the pro-lifers strategy. Furthermore, the supreme court was in error when they claimed that the right to murder babies was in the Constitution. The states have promised to uphold the US constitution and their own constitutions, not the opinions of the supreme Court. If states were not allowed to challenge the rulings of the supreme Court, we would still have Slavery (Dred Scott v. Sandford). It’s time for our “pro-life state” to become the first Abolitionist State and lead the nation to abolish human abortion.